Dr. Jeffrey Royal has obtained a BA in Economics from UNC-Chapel Hill, a second BA in Anthropology, and a MA in Anthropology from USC-Columbia. Dr. Royal completed his doctorate at Texas A&M, under the tutelage of some of the foremost scholars in maritime archaeology. After his graduate studies, Dr. Royal served as the Director of a non-profit research foundation for over a decade where he was responsible for the inception, development and implementation of projects, along with all the associated data analysis and publication. In this position since 2003, he directed or co-directed 45 field seasons of 14 different projects in 11 countries throughout the Mediterranean. In this position he supervised students from all of these countries as well as the U.S., and served as the primary interface with representatives of the host governments. 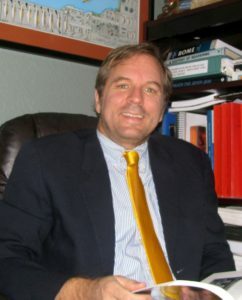 During that time he led students from diverse backgrounds, from various US and international universities, in field research, and served on MA thesis committees as an Adjunct Professor/Contributing Scholar in the Maritime Studies Program at East Carolina University, and conducted guest lectures in many university classes in the U.S. and Mediterranean countries. As a recent visiting Lecturer at the University of Nottingham, Elon University, and Philipps University (Marburg, Germany) he taught both undergraduate and graduate courses. At Philipps University, Marburg, Germany, he garnered a Visiting Assistant Professor position in the Department of Classical Archaeology. This position was part of an EU-funded initiative to widen the program within the Department of Classical Archaeology. Dr. Royal team taught two courses remotely as a Visiting Professor in the Department of Archaeology at the University of Nottingham, and a lecture series as an Assistant Adjunct Professor in the Department of World Languages and Cultures at Elon University.